If you can’t find your coupons you can’t use them. The best way to organize coupons for the least amount of money is by using a Coupon Box. Here are the steps to create your own Coupon Box. 1. Purchase your supplies. The size of the box is very important because it allows the envelopes to fit without moving and this size fits perfectly in the child seat of a grocery cart. Also, a box with a secure lid is important because you don’t want to drop it and have all of your coupons fall out. 2. Create your categories. Here are the categories that I currently use. You will need to create one card per category by writting the category name at the top of the index card. 3. 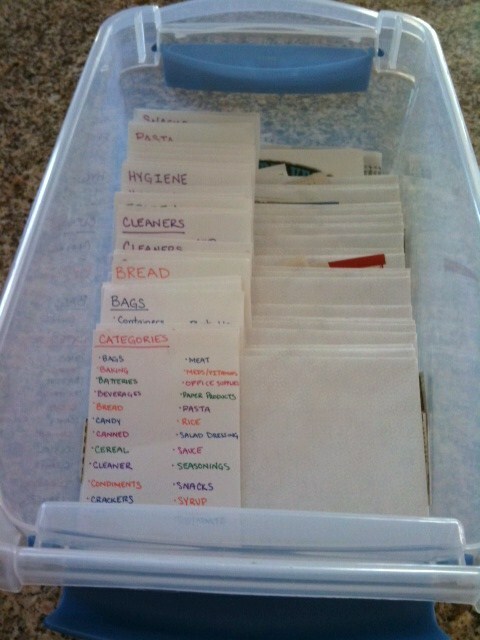 Create your dividers by putting each category card inside an envelope. I suggest folding the flap of the envelope in so that the index card slides in easily. The index card should be standing up like in this picture. 4. Organize your Coupons. Start clipping your coupons and put them behind the appropriate divider. If you have multiples of the same coupon you can paperclip the like ones together. 5. Create envelopes for each store you shop at. 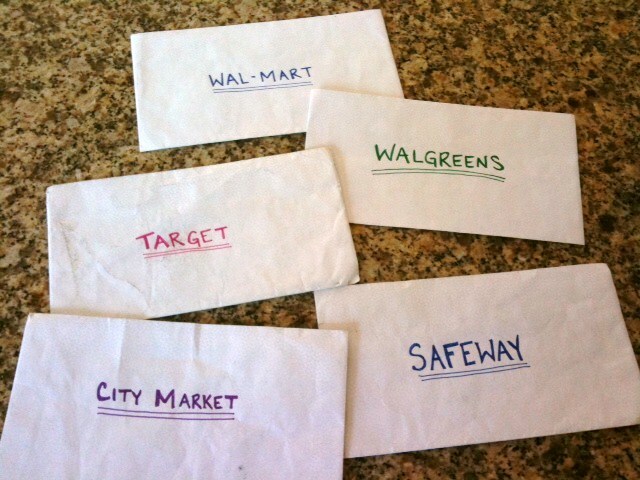 By having a separate envelope for each store you can easily put coupons in the appropriate envelope when you find a deal. 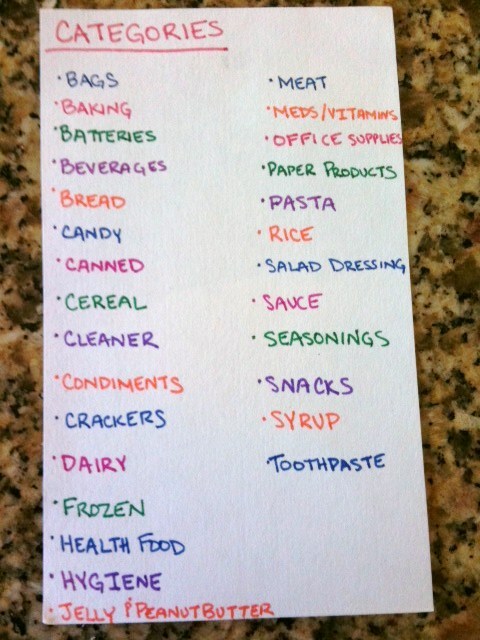 Use a blank index card for your shopping list; this helps you remember the deals when you get to the store. 6. 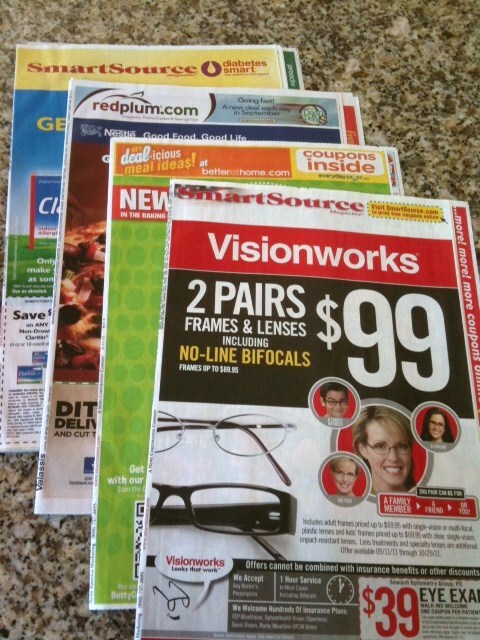 Finally, decide how to organize your weekly newspaper coupon inserts. When I first started couponing I used the “whole insert” method, which requires you to write the date on the ad and file the whole insert in an accordion folder. However, I found that I missed coupons because the coupon database misses some of the coupons from my region. Now I clip ALL the coupons out of the inserts and file them directly into my coupon box. 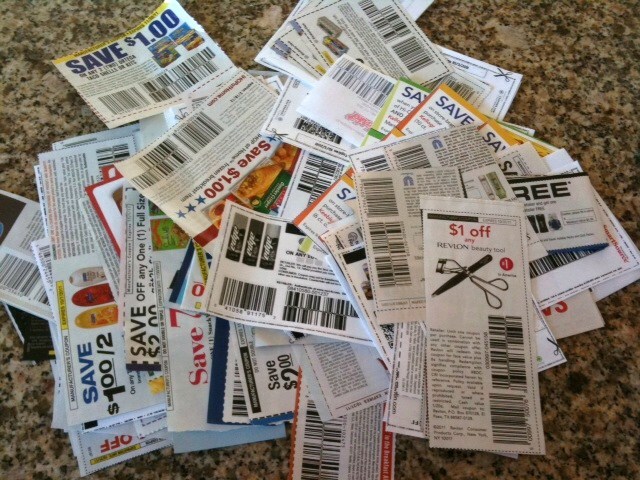 I spend 2-3 hours every Sunday clipping coupons, organizing them, and removing the expired coupons. This method has worked great for me, I hope it works for you too!